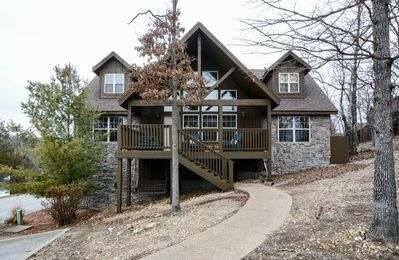 Relax and unwind in this beautiful 4-bedroom, 4-bathroom vacation rental cabin in Branson! 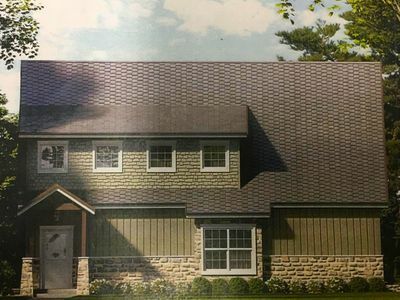 This rustically decorated home features a full kitchen, a large patio, a fireplace, and a large whirlpool bathtubs. 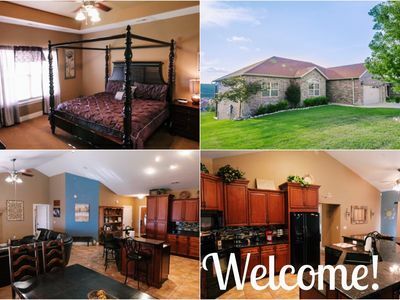 Just moments from Silver Dollar City theme park and a short 2 miles from Indian Point Marina, this rental provides plenty of fun right outside your door. 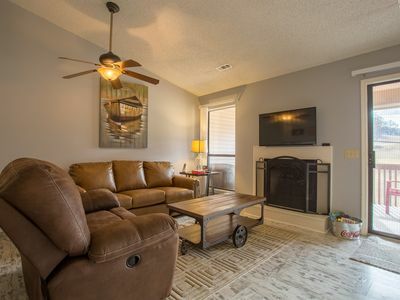 No matter your vacation style, this rental is sure to have what you’re looking for! 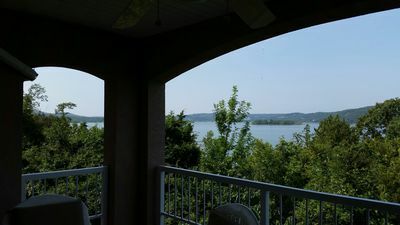 Before entering the home, you’ll step into a lovely covered deck area complete with wraparound windows and a dining table set for 10. 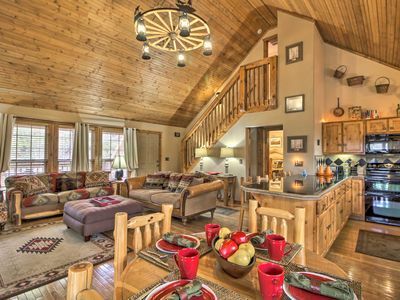 From there you’ll walk into a large, open space with vaulted ceilings, rustic cabin decor, hardwood floors, and wooden walls throughout. 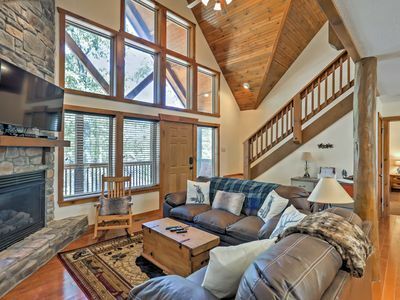 The space features a living area, complete with plush leather couches, a flat screen cable TV, and a fireplace with a floor-to-ceiling stone facade.The area also features huge windows letting in plenty of natural light and providing views of the greenery outside. 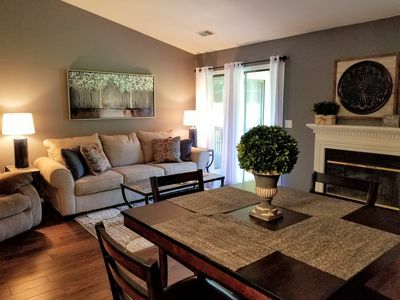 Steps away from the living area sits a dining nook, complete with a large wooden table perfectly set for 6. 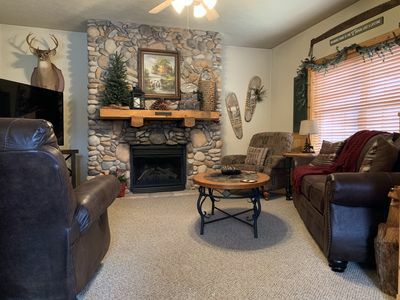 The area also features a rustic antler chandelier and keeps with the theme of cabin decor. 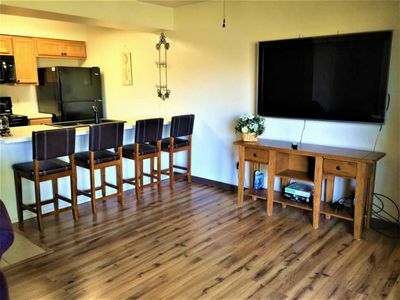 Just off of the dining nook is a fully-equipped kitchen complete with a refrigerator and freezer, a dishwasher, an electric stove and oven combination, and a microwave. The kitchen also offers ample counter space and comes stocked with utensils, a knife set, and dishes. 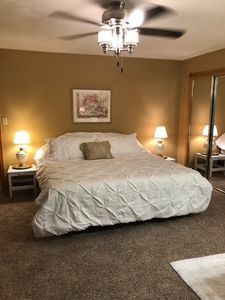 The downstairs master bedroom features a king-sized bed, a flat screen cable TV, and an attached bathroom with a jacuzzi tub. 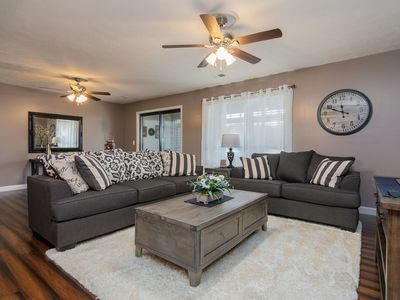 Upstairs, you’ll find the other 2 bedrooms. You won’t have to travel far to find something to do! 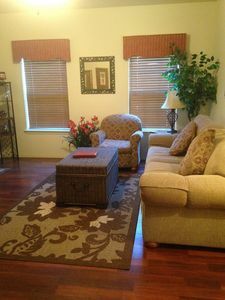 The property sits right in front of the subdivision clubhouse and pool area. 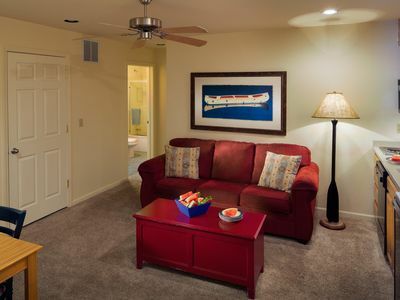 Cool off in the community pool or take advantage of the clubhouse amenities, including a fitness room. 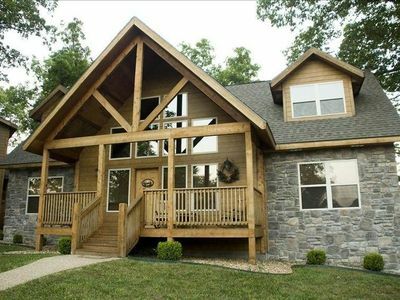 The kids will be excited to learn that this cabin is within walking distance of the shuttles at Silver Dollar City. 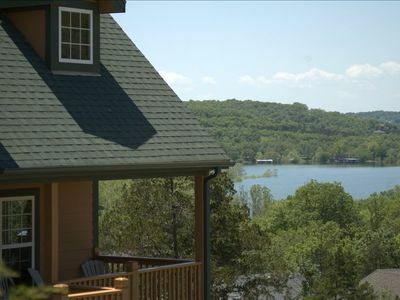 It’s also situated a short 25-minute drive from the heart of Branson, making it easy to enjoy everything Missouri has to offer! 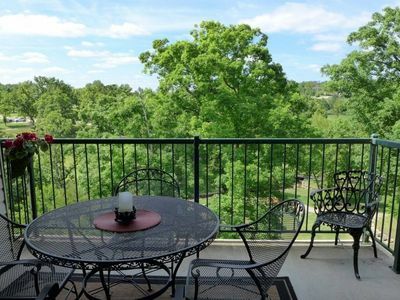 Close to the rental, you’ll find Indian Point Marina, and Dogwood Canyon National Park so you can enjoy the outdoors and some family fun without traveling far from home. 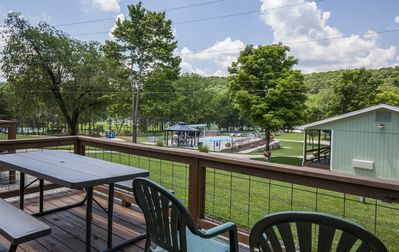 In downtown Branson, you’ll find no shortage of ways to keep yourself entertained. From the giant ferris wheel, Fritz’s Adventure, and Fireman’s Landing on the 76 Strip to the multiple shows in the theater district and the large array of shopping and dining options, the city has something for every style. 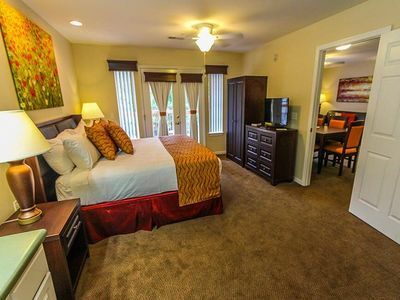 Holiday Hideaway- Lovely 2 Bedroom, 2 Bath Condo with cozy King Size Beds! 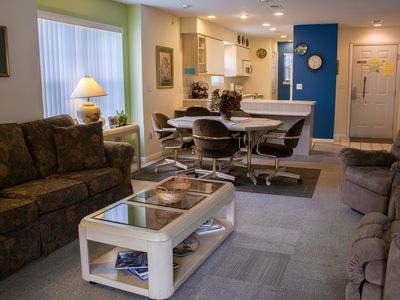 Pointe Royale One Bedroom Condo - INDOOR POOL! WOW!! LOW APRIL PRICING!! 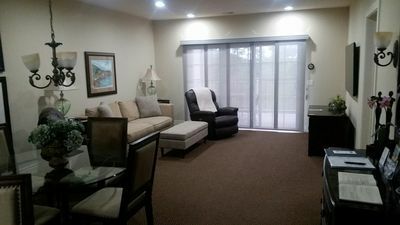 Townhome in Pointe Royale! Indoor & Outdoor Pool!